At The Cathedral School, sixth grade is about growth and development as students and leaders. In the classroom, students explore the origins of ancient civilizations and cultures, investigate basic concepts of math and science through a variety of lenses, and take on the study of Latin as their sixth core academic subject. As members of the Cathedral community, sixth grade students further amplify their voices with their participation in the Social Justice and Equity curriculum and through their performance in the sixth grade’s Civilization Play. In sixth grade mathematics, students solve algebraic equations, learning the order of operations, inverse operations, and two-step equations. They investigate probability and permutation, ratio, proportion, and scale. In geometry, students study coordinate plane, transversals, angles, area and perimeter of irregular shapes, and graphing. In class, students use problem-solving, independent and group projects, hands-on work, and class homework review to deepen their understanding of the subject. Focus is on the ancient world as sixth graders read and discuss ancient Greek mythology, especially the stories of The Iliad and The Odyssey as foundational literature. They also read and analyze modern poetry and novels that connect to the themes of odyssey literature. Students develop analytical writing skills with emphasis on defending a thesis, organizing ideas, and referencing primary texts. They also write creatively, including fiction, drama, and poetry. The study of vocabulary and grammar includes investigating prefixes, roots, and suffixes as the building blocks of words and focuses on a deep understanding of the parts of speech and on sentence structure (subject, verb, object) in anticipation of studying Latin. In the Upper School Lab, sixth graders develop and apply scientific inquiry skills, measurement, and the scientific method to experimentation. They also develop and use age-appropriate design-thinking skills through problem-solving and STEAM-oriented activities. Subjects include Astronomy: interactions of the earth, sun, and moon, solar system, galaxy, and universe; and Earth Science: plate tectonics, earthquakes, volcanoes, erosion and weathering, rocks and minerals, weather and data collection. Students also learn the fundamentals of lab work, including maintaining a lab notebook and proper scientific report writing. A concentration on ancient civilizations defines the sixth grade social studies curriculum. Units include Ancient Egypt: development of culture and civilization; Ancient Greece: government, philosophy, and drama; Ancient Rome: building of an empire; and Ancient Latin America: culture, civilization, and connections. Students explore different historical perspectives for critical analyses and incorporate primary sources and technology into a comprehensive research project. The sixth grade annual cultural play in February explores one of the ancient societies from Greece, Egypt, or Latin America. In addition, the social justice curriculum explores global citizenship, the destructive power of stereotypes, and a study of the history of oppression as an anchor to create the mechanisms to dismantle oppression. The sixth grade continues the study of French or Spanish, meeting four times during the six-day cycle. In class, language acquisition study includes listening activities, pronunciation practice, and beginning reading and writing. Students practice basic grammar: articles, adjectives, adverbs, prepositions, regular and irregular verb conjugations in present tense, and forming simple sentences. Students build vocabulary and develop beginning conversational skills by exploring French- or Spanish-speaking cultures. As part of their Cell Biology unit, students work in groups to research the structure and function of six cellular structures: the nucleus, mitochondria, chloroplasts, the Golgi apparatus, endoplasmic reticulum, and membrane. They receive guiding questions, and then develop their own inquiries into the discovery of their organelle, its evolutionary history, and its adaptations. Students also prepare mini-models of the organelles they've researched to display in class during this unit. 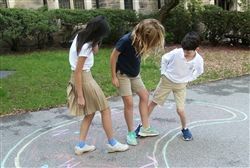 Then, the students go out on the campus and use large chalk drawings of organelles to review structures and develop an understanding of the structural similarities and functional relationship between these organelles. The unit caps off with two microscopy labs studying the diversity of cell morphologies and sugar breakdown in plant cell mitochondria.